Learn how to create a beautiful illustration of an ant using mostly circular shapes and curved lines. Ants are fun animal to illustrate mainly because they are delicate creatures as well as strong ones. These cute insects are visually fascinating to sketch! 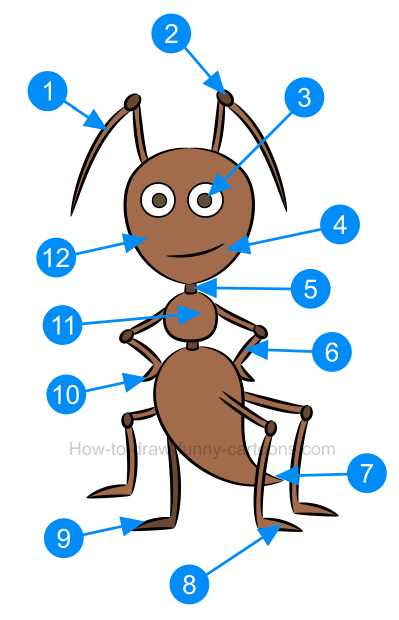 Before proceeding with the first part of this tutorial, let's take a moment or two to learn more about this cartoon ant using the image found above. Antennas are mostly made from long curved lines. A small dot can be found in the middle of both antennas. Eyes and pupils are created from simple circular shapes. The mouth is done using a curved line. The neck is small and represented by a small square. Arms are also made from long and thin rectangles. The tip of the body is sharp and pointed. Feet are flat and made from tiny curved lines. The leg on the back must be filled with a darker color. Hands are done using small curved lines, just like the feet. The top of the body is done using a small circle. The shape of the head is circular although the bottom must be sharp and pointed. Let's start by sketching a few basic elements to represent the body and the head of the insect. You can begin with the addition of a large circle to form the head. The top of the body is made from a small circle while the bottom of the body is created from a long oval shape and a triangle. 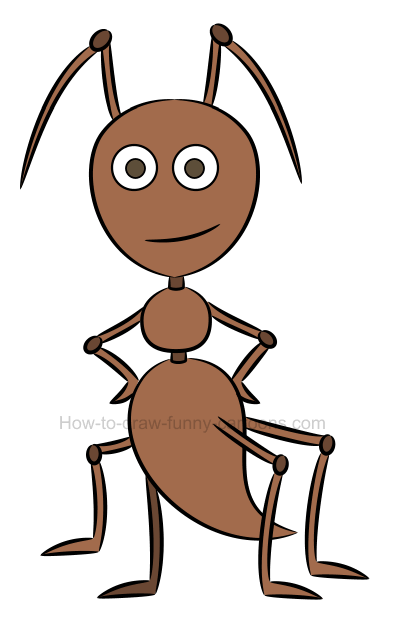 It's time to finally draw this illustration of an ant. The head is made from a curved line that is sharper on the bottom. 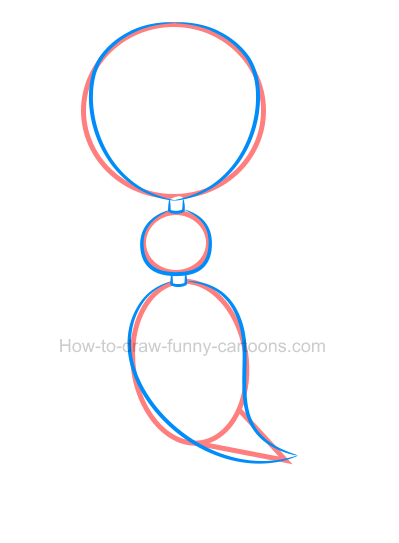 The neck is thin while the top of the body is done from another circular line. Finally, work on the bottom of the body using long curved lines. 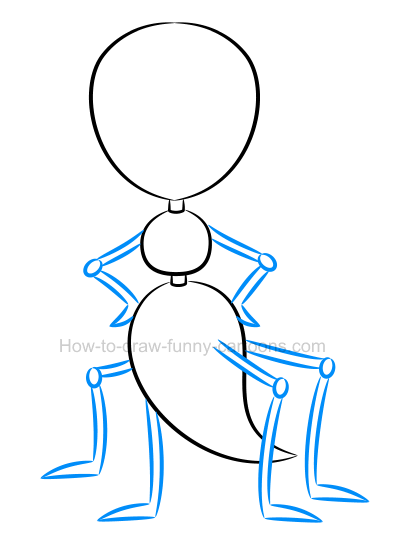 Next, you can draw the arms and the legs using simple curved lines and dots. These dots are added near the elbows and the knees. Hands and feet are created using additional curved lines that are also small and pointed. 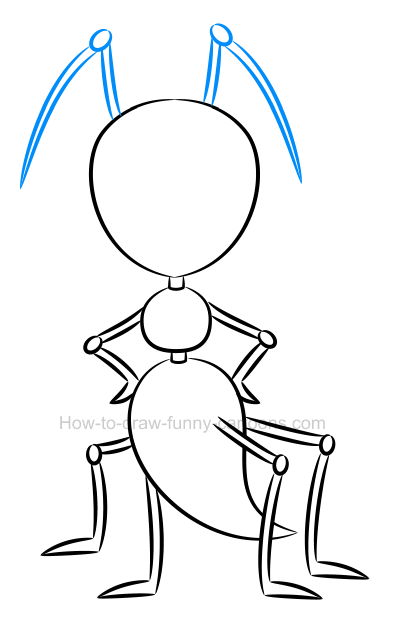 On top of the head of this illustration of an ant, add two large antennas using long pointed lines and dots. Don't hesitate to create very large antennas if you want to create a more dynamic and visually appealing character. This step is quite simple. Inside the head, draw two small circles to represent the eyes. You can also add pupils using small dots. Finally, draw the mouth using simple curved lines with pointed ends. Good work! Let's add colors! 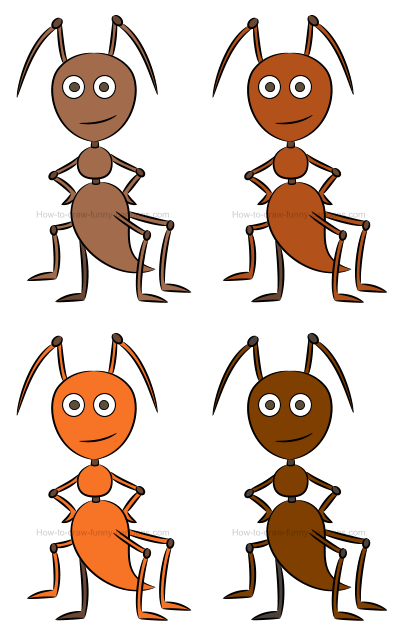 The whole cartoon ant is filled with a bright brown color. Only dots found in the middle of the antennas, near the elbows and the knees are darker. You can also use this same color inside the pupils and on the leg found behind the character (to create a little bit of depth). Great! 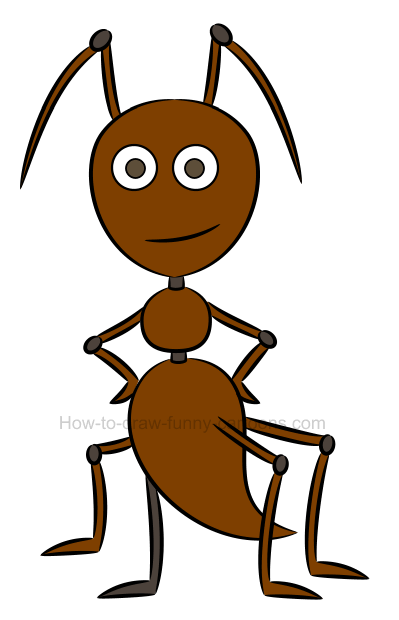 This illustration of an ant is completed! These are all six steps required to draw our cartoon friend. The most challenging parts are probably the legs and the arms. Creating a fun posture is also something quite difficult if you are not familiar with the anatomy of this particular insect. Let's now try a few alternatives using different colors inside the same cartoon character. In this first variation, the color used is brighter and more saturated. It's still quite relevant for this cartoon character. Can we make this illustration of an ant even brighter? Let's give it a try! A brighter version of the same color is now added inside the character. In fact, this version is almost filled with an orange color. The character is hard to miss now ... perfect if you want to draw a simple image for kids and children! Switching to the dark side! For this last attempt, the character is now filled with a very dark brown color. Whether is closer to reality or not, this version is definitely harder to read than the previous ones. It's not necessarily a bad thing, it's just something different. 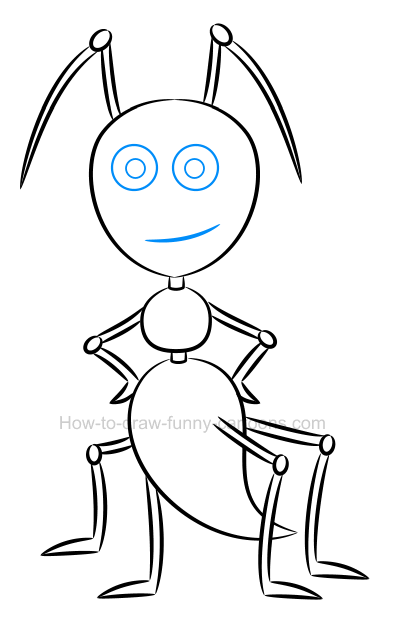 Have fun drawing more amusing ants like this one!